I love history…and I love biographies. So it has been a treat to begin this year with a daily devotional that brings them both together, The One Year Book of Christian History by E. Michael and Sharon Rusten. 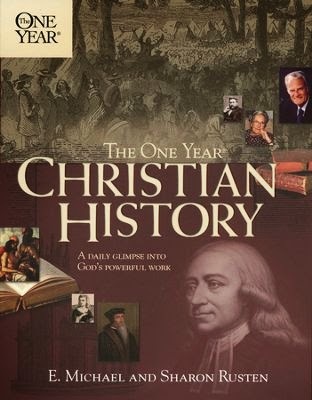 Each day’s reading takes me to some spot on the 2,000-year timeline since the Church began, and ties that day’s date to a significant event in Christian history. While mostly narrative, I think the authors do a good job of balancing historical context and personal story. I like that though the book covers many of the better-know figures of Christian history (Amy Carmichael, Hudson Taylor, etc. ), there are many I’ve never heard of. For example, today’s reading (January 23), tells of Lott Carey, a black slave in 1780 Virginia who became a Christian, was able to purchase his freedom, and on this date in 1821, sailed to Liberia as the first black missionary to Africa. I don’t know about you, but I find it so moving to read stories like this about real people. It’s wonderful to step back and get a glimpse of the big picture of God’s plan at work through the ages. Their example of faith and perseverance in the face of deep trials and difficulties is so inspiring. I’m challenged afresh to walk faithfully before Him in my own generation! Yes, real saint's stories are so encouraging! Sounds like a good book. Oh, that sounds like a great book. I, like you, love history and biographies too. I will have to look into this one.